Following is a table of states, i.e., countries, with respect to which the right of priority referred to in 35 U.S.C. 119(a) -(d) has been recognized. The table indicates whether a basis for priority is that the state is party to the Patent Cooperation Treaty (PCT) or the Paris Convention for the Protection of Industrial Property (Paris), or a member of the World Trade Organization (WTO). See 35 U.S.C. 119(a). 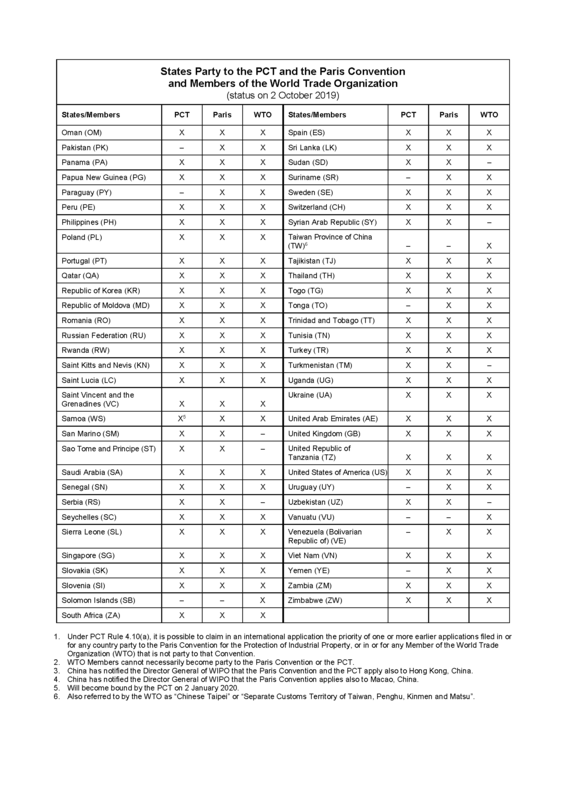 See www.wipo.int/export/sites/www/pct/en/texts/ pdf/pct_paris_wto.pdf for the most current version of the table reproduced below. See also www.wto.org/english/thewto_e /whatis_e/ tif_e/org6_e.htm for a current list of WTO member countries along with their dates of membership. Applications for plant breeder’s rights filed in WTO member countries and foreign UPOV contracting parties may be relied upon for priority pursuant to 35 U.S.C. 119(f). See MPEP §§ 1612 and 1613. 35 U.S.C. 365(a) provides that a national application shall be entitled to the right of priority based on a prior international application of whatever origin, which designated any country other than, or in addition to, the United States. Of course, the conditions prescribed by 35 U.S.C. 119(a) -(d), which deals with the right of priority based on earlier filed foreign applications, must be complied with. As far as the actual place of filing is concerned, for the purpose of 35 U.S.C. 365(a) and (b) and 35 U.S.C. 119(a) -(d) and (f), an international application designating a country is considered to be a national application regularly filed in that country on the international filing date irrespective of whether it was physically filed in that country, in another country, or in an intergovernmental organization acting as Receiving Office for a country. Pursuant to 35 U.S.C. 386(a) and 37 CFR 1.55, a nonprovisional application may make a claim of foreign priority in accordance with the conditions and requirements of 35 U.S.C. 119(a) -(d) and 172 with respect to a prior international design application that designates at least one country other than the United States. Pursuant to 35 U.S.C. 386(b) and 37 CFR 1.55, an international design application designating the United States may make a claim of foreign priority in accordance with the conditions and requirements of 35 U.S.C. 119(a) -(d) and 172 and the Hague Agreement and Regulations thereunder with respect to a prior foreign application, international application (PCT) designating at least one country other than the United States, or a prior international design application designating at least one country other than the United States. The provisions of 35 U.S.C. 386(a) and (b) apply to nonprovisional applications, international applications (PCT) and international design applications filed on or after May 13, 2015, and patents issued therefrom. See 37 CFR 1.55(o) and MPEP §§ 213 et seq. and 1504.10. In addition to the list of recognized countries set forth in subsection I, above, applicants may claim priority under 35 U.S.C. 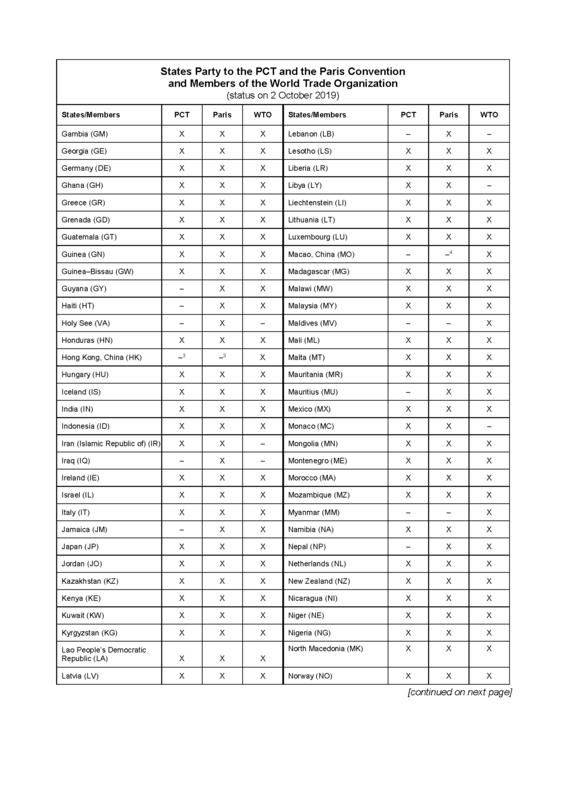 119(a) -(d) to applications filed in foreign regional patent offices having member states who are contracting states under the Patent Cooperation Treaty (PCT). These include the African Regional Intellectual Property Organization (ARIPO), the Eurasian Patent Office (EAPO), the European Patent Office (EPO), and the African Intellectual Property Organization (known under the acronym OAPI for its French name, Organisation Africaine de la Propriété Intellectuelle).